We develop and sustain the important and long-lasting relationship between clients and a lawyer. We deal with a wide range of legal advice at delivering excellent results very efficiently, our quality of service, expert specialist knowledge and the professionalism in our approach. K.K. is owned by its shareholders whose liability is limited by shares. K.K. is a separate legal entity to the company directors, therefore it is the business itself that shoulders the financial liability if the business goes wrong. To set up a Private Company by shares, you need to register with Legal Affairs Bureau. This is known as ‘incorporation’. Share transfer restrictions (if applicable). *The registration tax is 0.7percent of the capital fund of the company. If it is under 150,000JPY, the tax will be 150,000JPY. 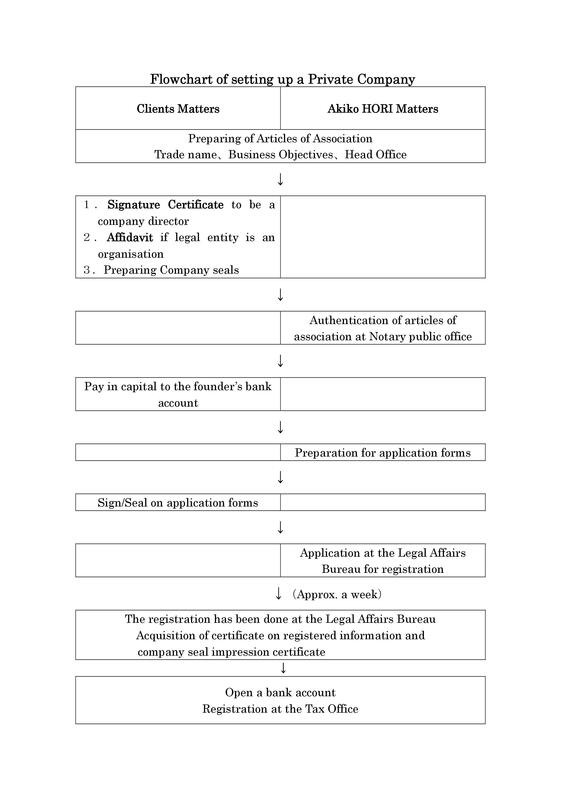 Model ARTICLES OF ASSOCIATION for K.K. The Company shall be called ABC Kabushiki Kaisha indicating ABC Corporation in English. The objects of the Company shall be to engage in the following business. All matters relating to the conduct of any business stated in any of the preceding items. The Head office of the Company shall be located in Chuoku, Tokyo. Public notices by the Company shall be given in Kanpo, the official gazette. The total number of shares authorized to be issued by the Company shall be 10,000 shares. Any transfer of shares of the Company shall require the prior approval of the Company. The Company can require that a person who has acquired the Company’s shares by general succession, including inheritance, shall sell such shares to the Company. A person who desires to acquire shares shall make their request certifying that the Company shall record the transference in the shareholder registry using the application form prescribed by the Company, affixing his/her signature or seal thereto, certifying that the application. The application shall be made jointly by the new shareholders and old shareholders or his/her general successors including his/her heirs except for the cases prescribed by the applicable Ordinance of the Ministry of Justice as cases of no likelihood of detriment to interested parties. Along with the request referred to in Art 8, the applicant shall pay a fee for the application. The Company shall consider shareholders who are recorded in the shareholder registry on the end of fiscal year of each year as shareholders entitled to exercise their rights at a shareholders general meeting (hereinafter in this article referred to as “Shareholders as of the Recorded Date”). （2） In cases where the rights that the Shareholders as of the Recorded Date can exercise are voting right at a shareholders general meeting, the Company may prescribe that some or all persons who acquire shares on or after such Recorded Date are persons who may exercise such right; provided, however, that this provision shall not prejudice the rights of the Shareholders as of the Recorded Date of such shares. (3) If the Company has prescribed a Recorded Date, it shall give public notice of such Recorded Date and the matters prescribed pursuant to the provisions of the preceding paragraph no later than two weeks prior to such Recorded Date. Shareholders or their legal representatives shall inform the Company of their names, addresses, the number of shares held by the shareholders, the date or dates when the shareholders acquired the shares and seals; provided, however, that as for foreigners who customarily use signatures, signatures may be used in place of seals. When any change has occurred in matters listed in the shareholder registry, it is necessary to report these to the Company. Issue of Shares for Subscription shall be made by a majority vote of two thirds or more of the shareholders present at the meeting provided that shareholders holding a majority of the votes of all the shareholders entitled to exercise their votes at such shareholders meeting are present. The Company shall convene a general shareholders meeting within three months following the end of a fiscal year. In any case that the Company deems it necessary, the Company may convene an extraordinary general shareholders meeting at any time. (2) The President shall convene a shareholders meeting by a majority vote of the Directors except in the cases prescribed by law. In the absence or disability of the President due to an accident, another Director of the Company, in the order previously determined by the President shall convene a shareholders meeting. (3) In order to call the shareholders meeting, the Company shall dispatch the notice thereof to the each shareholder no later than one week before the meeting. Except for the cases of voting forms for written votes or Electronic voting, the notice shall not be required in writing. A shareholders meeting may be held without the procedures of convening it if the consent of all shareholders is obtained except for the cases of voting forms for written votes or Electronic voting. The President of the Company shall chair a general meeting of shareholders. In the absence or disability of the President due to an accident, another Director of the Company, in an order previously determined by the President shall chair a general meeting of shareholders. Unless otherwise provided for in law or the articles of incorporation, the resolution of a shareholders meeting shall be made by a majority of the votes of the shareholders present at the meeting where the shareholders holding a majority of the votes of those shareholders who are entitled to exercise their votes are present. (2) The resolutions provided in Paragraph 2, Article 309 of the Companies Act shall be made by a majority of two thirds or more of the votes of the shareholders present at the meeting where the shareholders holding a majority of one third or more of the votes of the shareholders entitled to exercise their votes at such shareholders meeting are present. In cases where Directors or shareholders submit a proposal in respect of a matter which is the purpose of the shareholders meeting, if all shareholders (limited to those who may exercise their votes with respect to such matter) manifest their intention to agree to such proposal in writing or by means of Electromagnetic Records, it shall be deemed that the resolution to approve such proposal at the shareholders meeting has been made. (2) In cases where the Directors notify all shareholders of any matter that is to be reported to the shareholders meeting, if all shareholders manifest in writing or by means of Electromagnetic Records their intention to agree that it is not necessary to report such matter to the shareholders meeting, it shall be deemed that such matter has been reported to the shareholders meeting. Any shareholder or his/her legal representative may exercise their votes by proxy of another shareholder with voting rights or a relative. In such cases, such shareholders or proxies shall submit to the Company a document evidencing the authority for the proxy. Minutes shall be prepared with respect to the business of the shareholders meetings pursuant to the provisions of the law. (2) The Company shall keep the minutes referred to in the preceding paragraph at its head office for the period of ten years from the day of the shareholders meeting. The number of Directors of the Company shall not be less than one. A Director of the Company shall be elected by a resolution of a shareholders meeting. (2) Resolutions for the election of a Director shall be made by the majority of the votes of the shareholders present at the meeting where the shareholders holding a proportion of one third or more votes of the shareholders entitled to exercise their votes are present. (3) No cumulative voting shall be used for the election of Directors. Directors’ terms of office shall continue until the conclusion of the annual shareholders meeting for the last business year which ends within ten years from the time of their election. (2) The term of office of the Director who is elected as a substitute or due to an increase in the fixed number shall be the remaining term of office of the predecessor or the current Director. In cases where there is more than one Director, Directors shall elect a member of the Directors as its President and representative Directors. (2) The President shall represent and supervise the Company. (3) The Company may elect, if necessary, one or more Vice Presidents, Managing Directors, Senior Managing Directors from among its Directors. Remuneration and retirement benefit paid to Directors as compensation for their executing their duties shall be set by resolution of the general meeting of shareholders. The fiscal year of the Company shall be a one-year period commencing on 1 April of each year and ending on 31 March of the following year. The Company shall, by resolution of the general meeting of shareholders, appropriate dividends from surplus and pay the same to the shareholders or registered share pledgees appearing or recorded in the final shareholder register as of the last day of each fiscal year. (2) The Company shall be relieved from obligation to pay a dividend if the dividend has not been claimed for a period of three years after the Company tendered the payment thereof. A limited liability company (LLC) is a separate legal entity and can own property, incur debts, sue and be sued. Any business dealings are made on behalf of the company. Its owners are liable only for the amount they invested. An LLC must have at least one director to manage the business. The LLP itself will be liable to the full extent of its assets, but the liability of the members will be limited. Designated members are responsible for carrying out certain duties including signing the annual accounts that would normally be carried out by a director. The date of LLP establishment. A branch office does not have a separate legal corporate status so claims and liabilities arising in the branch can be applied to the main company of which it is part. It could open its own bank accounts or lease property in its own name but it will need to negotiate with a bank or landlord. Details of the home company. A representative office is the least expensive way to make contact with and establish a presence in the Japanese market but it cannot open its own bank accounts or lease property in its own name. A representative office generally cannot engage in profit making activities, such as accepting payment for services or issuing receipts. The detail of the home company. © Copyright 2015 堀明子司法書士事務所. All rights reserved.